I am an outdoor enthusiast born and raised in Wisconsin. I currently reside in Western Wisconsin with my family. An IT Consultant by day, I enjoy unwinding in the outdoors. If I am not fishing or spending time with my family, you'll find me riding my fatbike year round on local trails. 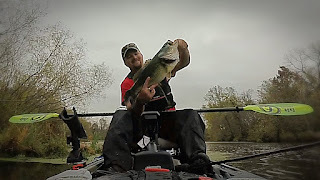 I am a prostaff team member with Ardent Reels, a member of the FeelFree Kayaks Fishing Team, TourneyX, Kayak Bass Fishing, Midwest Bass Magazine, and B.A.S.S.. I enjoy helping others, teaching, and sharing my experiences. Thank you for taking the time to read my blog. I welcome any questions, requests, or feedback. You can reach me at tyler@smallcraftfisherman.com. Be safe and tight lines! I am a kayak fishing addict and will do just about anything I can to spend a few moments on the water. I am currently located in Decatur, IL pursuing a career in Conservation Biology. I have had the opportunity to fish many of the best lakes in Illinois. I mostly specialize in bass and bass tournaments but I do have an extensive crappie fishing past. I am part a Kistler Rods Prostaff Team member, Jackson Kayak Enthusiast, Kayak Bass League, Kayak Bass Fishing and TourneyX member. If you ever have any questions about my articles or if you are ever in the area shoot me an email at Pooti@smallcraftfisherman.com.